While not native here, Kentucky coffeetree is the only member of its genus native to North America. A member of the legume family, it has sometimes been called the “dead tree” as it lies dormant for six months of the year (gymnocladus means “naked branch”). Its seeds (said to resemble coffee beans) grow in pods on female trees, which can be a nuisance in urban areas when they drop to the ground. Its wood quality is good but not widely used. 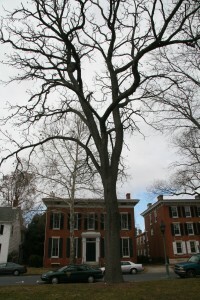 Kentucky coffeetree seeds are toxic to humans and animals. Its long leaves contain many leaflets that are pointed but not toothed.